In any business existing customers leave and new customers arrive. However, there are customers who are the backbone of any business, they are the loyal customers. According to Accenture 28% of consumers are loyal to their providers and brands, which is why all effort should be taken to keep such customers and increase their number. However, businesses focus on attracting new buyers and often forget about those customers who have been staying with them for a long time being loyal to their brands. These consumers feel frustration and leave as soon as they find an alternative. In this blog post I have described 5 reasons why businesses lose their loyal consumers. I hope that better understanding of this problem will help your business to retain loyal customers and provide a better customer service to them. It is necessary to offer discounts or incentives to land new customers. 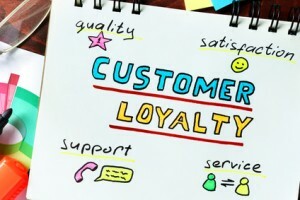 However, existing customers can quickly notice the fact their loyalty is not rewarded. According to GfK 49% of consumers will gladly switch brands for a coupon. That is why you need to think hard about the discounts you offer to new customers and make sure you do not forget about your existing customers. Your new customers can come because of discount for one-time purchase while sales to existing customers typically result in a bigger impact on your bottom line. Every business has its key products or services and key customers that form its foundation. If you make a list of what those customers buy, you will see that this list is the foundation of your business. You cannot afford to lose your loyal customers while focusing on attracting new buyers. According to Accenture 80% of ‘switchers’ feel the company could have done something to retain them. Just do not take your loyal customers for granted and do not forget they keep your business lights on. Various policies and guidelines are great for ensuring that employees comply. However, in some cases they limit your employees and do not give them the freedom to make the right decision when it is necessary. 81% of consumers admit that it is frustrating dealing with a company that does not make it easy to do business with them. Your customers do not care about your internal company rules. They want their issues to be resolved right here and right now. 47% of customers would take their business to a competitor within a day of experiencing poor customer service. Teach your employees to resolve customers’ issues fast and efficiently, empower them with the right tools and authorize to make decisions. This in turn will guarantee your business success and increased level of customer satisfaction. Top 3 reasons for consumers to switch brands are cheaper pricing (31%), rude staff (18%) and too many mistakes (16%). Price factor may become critical to your customers when they start looking for an alternative to your product or service. And if they find the same quality for a better price they will not stay with your brand and will switch to competition. To engage customers businesses offer coupons and discounts, that is why the price may seem lower. Offer your customers loyalty programs and reward them for staying with your brand. In return you will receive a positive feedback and boost repeat purchases. Loyal or key customers are those people who keep your business lights on. Just do not forget about their importance. You are welcome to share your ideas, recommendations and success stories in the comments to this blog post. I Agree 100% with what Olga had to say and i have worked for a company now for 15 years and the incentives were given to new customers but the older and loyal customers were left in the cold. I and most others working with me in the telecommunications as an outsource company to one of the larger Cell Phone service suppliers would make suggestions but they never listened and then scrambbled when they realized that the loyal ones were leaving… ??? I just rack it up as the wrong people in the wrong places in Management . Thank you for your comment, Brian. I find it very unfortunate that companies which are not grateful for customers’ loyalty realize their mistake only after their customers start leaving.